What will be the next ubiquitous locally grown app? We download three new apps launched by Chicagoans to find out. The Flashlight app made its local creator, John Haney, something of a tech celebrity. 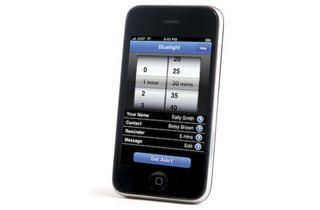 His super-basic app, which turns PDAs into lights, has been downloaded 52 million times. (That’s the number of grains of sand on a beach, right?) We tested three recently launched local apps to see who might follow in his footsteps. For ten years, Daniel Fedor had a once-a-week morning routine: He’d depart his Lincoln Park condo and search for a taxi. “I always thought it was silly that there never seemed to be an open cab—even though I’d see them with one person, probably going downtown,” Fedor says. The real-estate attorney started offering to split a cab with passersby. According to Fedor, “I was never turned down. I even asked my now-wife out by sharing a cab.” Fedor copyrighted a color-coded card system that would flag-down shareable cabs by destination. The concept never left the ground. So Fedor turned to developer Uki Lucas to digitize his idea. Taxi Share is now accessible on Android phones in beta mode. Plug in your departure time and a color-coded general location (downtown=blue, O’Hare=red, etc.). A Google map pops up, and a dot on that map symbolizes another user willing to share a cab in the same direction. Press a button to go into “color flash” mode: Your phone screen glows a color that signals your intention to taxi drivers. The app just soft-launched in January, so we crossed our fingers, hoping that another user would be logged on and going in our direction. We got lucky but were unsure how that user would find us. So we turned on the color flash…and then what? Hold it up to hail a cab? Show it to potential taxi riders? Fedor says he’s going to push marketing so a flashing colored phone is automatically understood by taxi drivers and riders alike. The summer before heading off to college, 18-year-old Betsy Huigens wanted to alleviate her parents’ anxieties about the big move. “I was thinking, it would be nice to let someone know when they should worry.” Huigens, who had no experience in the tech industry, met Nick Rosa from venture fund Sandbox Industries at a college networking event. They discussed her idea of an app that tells an emergency contact that its user is in trouble. The conversation evolved into a business plan; Huigens, now 20, works for Sandbox as an intern, and her iPhone app debuted last month. “I never expected to get involved in tech—weird how things work out that way,” Huigens says. Say a college kid is going to the library late at night. She’d choose her expected arrival time from a counter. Then she writes her name, an emergency contact number, a reminder time (the standard is five minutes) and a message (the default: “I did not check in with my bluelight app. Please call me.”). If she doesn’t turn off the alert when she’s arrived at her destination, the app sends the message to the emergency contact and, importantly, gives the kid’s location via the phone’s GPS. 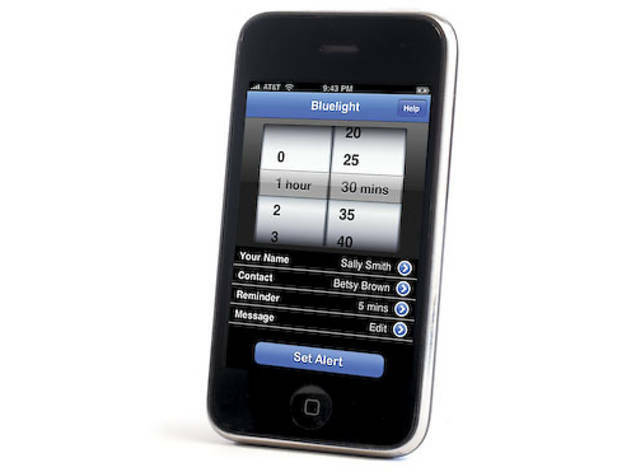 Although the app necessitates a few offline steps (the emergency contact must understand what the heck Bluelight is), the interface is very easy to use: It took us about 35 seconds to load the requisite information. Unfortunately, “the alert was not able to be sent to the server,” according to an error message. Smooth out the kinks, and this one should work like a charm. D.J. “the Medicine” Grant takes sneaker collecting very seriously. So seriously he travels to other states to shop. He’s not the only one. Grant started keeping tabs on mom-and-pop sneaker stores in order to give advice to inquiring collectors. Grant, a Chicagoan, illustrates the national range of his hobby: “I’ve been asked a million times where to go in California.” In 2009, he worked with two buddies to debut the app, which became available on Android in November 2010. To register the app, you need to sign in with your personal information, including “last shoe purchased” and “last boutique visited.” We searched for nearby stores and received a straightforward, vetted list of small shoe stores, including South Loop’s Jugrnaut and Succezz. Easy-peasy, but we wish there were more ways to interact with fellow sneaker aficionados. Maybe for version 3.0?